Whether you are new to Sedona, just passing through, or have lived here all your life, we would love to have you worship the Lord with us. The presence of the Lord is what we pray for in our services, and the Lord is always with us to inhabit our worship and fill our hearts with His presence. Our purpose is to exalt the Lord in all we do, and we want to throw a big loop (or a lot of little ones!) to take as many of our friends and neighbors to heaven with us as we can. Our beautiful town of Sedona is nestled in the beauty of God's amazing landscape of red rock cliffs and high desert of Northern Arizona. Sunday morning Cowboy Breakfast: 9:15 a.m to 10:15 am. Sunday morning Youth Group meet for breakfast: 9:30 am. Youth Group (middle school & high school): Wednesday evening 6:30 p.m. Come for food and fellowship. Ladies' get-together: 4th Tuesday at 5:30 p.m.
Men's fellowship: 1st Tuesday at 6:00 p.m.
Nursery available for babies under age 3. 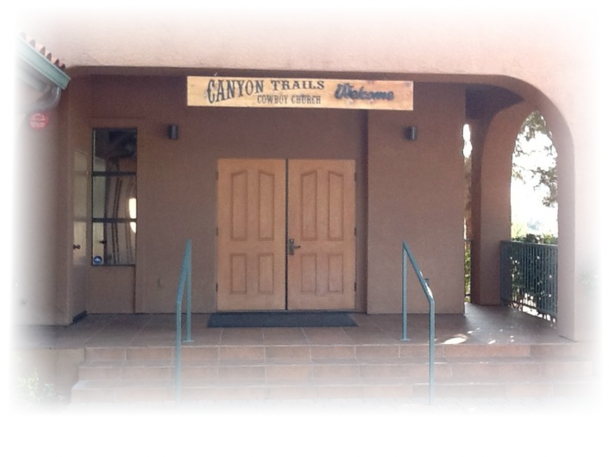 Besides our regular Sunday services, we always have lots going on here at Canyon Trails Cowboy Church! Start your Sunday morning with a complimentary Cowboy Breakfast in the Fellowship Hall from 9:15 to 10:15. The sanctuary is open for prayer from 9:45 - 10:15 and worship service starts at 10:30. For our kids we have Kids' Church for ages 3 through grade 5. They meet during the Sunday morning service after the worship and praise time. We have a nursery for our younger children. Parents may sit in the nursery and still hear and see the service. Each month, usually the 4th Tuesday at 5:30pm, our ladies have a get-together to strengthen our relationships, and to share with one another. We have a wonderful time doing crafts, testifying, and having a devotional time together. It's wonderful to be able to bond with our sisters in Christ. Check the calendar for events. The men gather for fellowship the 1st Tuesday at 6:00 Come hungry! Invite a friend. We meet in the fellowship hall. Our youth group has some fun evening events planned for students in middle and high school, age 11 on up. Check the calendar for dates. We meet on Sunday mornings before church at 9:30 am for breakfast and connection, and Wednesdays at 6:30 pm at the church for food and fellowship. Some Thursdays Pastors Zech & Shayla meet with small groups. We are a cowboy church, but you will feel welcome even if you are not a cowboy! Come in your cowboy boots and blue jeans, or your Sunday best. From the moment you walk in to the moment you leave, you will feel the love and welcome of the congregation as well as the presence of the Lord as we meet with Him in worship. Our Sunday services start at 10:30 a.m. with uplifting, upbeat, toe-tappin' music by our cowboy band. Then...well, from there it's up to the Lord. Typically we have worship and praise for about 30 minutes, including a round of "get around and shake hands", followed by a message from Pastor Wayne. The Sunday-school kids break away for their lesson after worship & praise time. The first Sunday of each month includes communion. Every service is filled with heart-changing awe as the Lord meets with us in a spectacular way - through a moving of His Spirit, or a confirmation of His presence among us. And, as Pastor Wayne likes to say, the altars are always open. If you want to come to the altar for any reason, you can do so at any time. No matter what happens during the service, you will leave feeling glad you came! Please be sure to sign the guest book located in the back of the sanctuary on the offering table.